MOTU presents its Stage B16 audio interface with analog and AES/EBU connectivity and AVB networking capability. Mackie introduces the new Mix series of analog mixers, with three compact and affordable models. Solid State Logic unveils today its new XL-Desk tabletop analog mixing console. Italien SKnote is fully dedicated to hardware now, and will introduce at AES three new units, including its first 500 module. 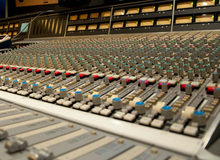 SSL will launch in December the new version of its Matrix analog mixing console.